If a movie is funny enough, does it need to have a point? Can a comedy be shaggy and artless, or is it better if it has a sense of visual style and a taut structure? What’s the proper standard here? Caddyshack or Brazil? Those questions popped into my head while watching Wanderlust, which came out on DVD and Blu-ray yesterday. Wanderlust is the fourth feature directed and co-written by David Wain, following Wet Hot American Summer, The Ten, and Role Models. Wain has also been a major creative contributor to the TV series The State, Stella, and Childrens Hospital, some of which he’s worked on with his frequent collaborators Michael Showalter, Michael Ian Black, and Ken Marino. Wain and his chums are funny people who make funny things, and Wanderlust is no exception. 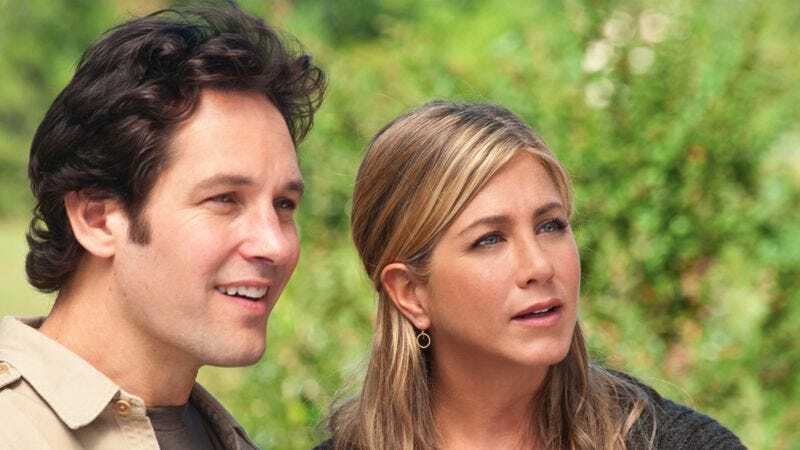 Jennifer Aniston and Paul Rudd (another regular in Wain’s circle) star as Linda and George, a New York couple who believe themselves to be upwardly mobile until they get smacked down, hard. HBO rejects Linda’s documentary about cancer-ridden penguins, and George’s job in the financial sector disappears when his boss gets arrested. They decide to regroup by moving in with George’s obnoxious suburbanite brother in Atlanta, but then they discover a modern-day commune called Elysium, and choose to embrace—tentatively, anyway—a life of openness and sharing. An obvious model for Wanderlust is Albert Brooks’ 1985 comedy Lost In America, which Wain and his co-writer Marino acknowledge in the Blu-ray commentary track (in part by having Kevin Pollak show up to do his uncanny Brooks impression). But Wanderlust weighs both sides of Lost In America’s story of in-over-their-heads yuppies trying to “find themselves.” Aniston and Rudd are spot-on as two children of the ’90s, whose conception of the hippie lifestyle was shaped by listening to Spin Doctors in their college dorms, and who aren’t really prepared for hallucinogenic tea, free love, and bathrooms without doors. Elysium, meanwhile, is populated by terrific comic character actors: Kerri Kenney-Silver as a cheerful earth mother; Alan Alda as an acid casualty who’s been around since the commune was founded; Joe Lo Truglio as a nudist who makes wine and writes political thrillers; and Justin Theroux as a hunky super-hippie who can seemingly do no wrong. One of the big jokes of Wanderlust is that while George and Linda aren’t as groovy as they thought they were, Elysium’s residents have been away from society for so long that they’re no longer fully aware of what they’re rejecting. (Theroux’s character, Seth, bemoans the “beepers and Zenith televisions and Walkmans and Discmans” that he says disconnect people from the real world.) The main idea of the movie seems to be that while it can be liberating to shrug off the shackles of corporate America and suburban family life, sometimes the codes of the counterculture are just as confining. At one point, for example, Elysium’s hardliners get mad at George for killing a fly, and when he apologizes and says, “I’m just trying to learn all the rules,” Seth corrects him, saying, “There are no rules.” But that’s clearly not so. George and Linda are constantly being judged, no matter where they live. As smart and funny as Wanderlust often is, though, the movie never fully comes together, either as a satire or a character study. As Nathan Rabin put it in his review of Wanderlust for this site, the film “loses its daffy charm whenever it attends to the needs of an arbitrary plot.” I like the movie more than Nathan—primarily because I think its hippie stereotypes serve a comic purpose and are frequently hilarious—but I agree with him that the plot is a drag on Wanderlust. I’d go even further and say that this is a problem that most big-screen comedies share these days: treating the story as an afterthought. And that’s not the only flaw that Wanderlust has in common with its contemporaries. The film is practically devoid of visual style, the pacing’s way out of whack, and the ensemble is too one-dimensionally nutty. The lack of style’s not a major problem, mind you. It’s true that many of the great comic directors were (or are) solid-to-superior stylists: Charlie Chaplin, Jacques Tati, Jerry Lewis, Frank Tashlin, Blake Edwards, Terry Gilliam, Woody Allen, and even Albert Brooks. And one of the best of the modern comedy directors, Adam McKay, makes movies that look like movies, with dynamic lighting and camera moves. But it’s also true that too much attention to the look of a comedy can distract from the more important job of creating an atmosphere in which actors can riff. The actors—and their aforementioned one-dimensionality—represent a trickier issue. We’re blessed to live in a time when there are so many talented comedians and comic actors on TV and in the movies, with gifts that extend beyond punchline delivery to include improvisation and a willingness to look buffoonish. But those same people keep appearing in project after project, to the extent that they’re becoming a little overfamiliar. This isn’t just the case of a troupe like The State’s core performers sticking together from movie to movie. For much of the past decade, big-screen comedies have seen mix-and-match casts featuring people like Rudd, David Koechner, Ed Helms, Megan Mullally, Nick Offerman, Rob Huebel, Kristen Wiig, Rob Corddry, Jonah Hill, Will Forte, and lately Malin Akerman (plus, oddly enough, Jon Hamm). And they are typically doing either broad characters or subtle variations on the same one-note type. These people are funny, but they’re also becoming a little predictable, and to an extent, interchangeable. Switch their characters from film to film, and for the most part, it wouldn’t make a huge difference. By contrast, Alda’s few scenes in Wanderlust stand out. He’s playing a stereotype—a grizzled burnout—but he brings real nuance to the part, just in the way he shades his line-readings and in his impeccable timing. Everyone else in Alda’s scenes seems to be thinking of something funny to say next, while Alda seems to living in the moment, confident that his presence is funny, no matter what he says. Similarly, Linda Lavin pops up for one extended scene at the start of the movie where all she has to do is react to Rudd and Aniston’s neuroses, and her deadpan sells the bit. The actor-actors often make more of an impression in modern movie comedies than the comedians do. Wanderlust’s biggest sticking points are its pacing and plot, which isn’t all that unusual these days. Unlike the two-hour rambles that have become the norm in the Judd Apatow era, at least Wanderlust is under 100 minutes. But it’s telling that the Blu-ray includes not just the usual assortment of outtakes, but an entire “bizarro cut” of the movie, which follows roughly the same story, but with different jokes. The bizarro Wanderlust wouldn’t really make much sense to those who hadn’t watched the theatrical version first, since it elides some plot points and adds others. And Wain made the right choices ultimately; there are some good jokes in the bizarro cut, but the raunch level is distractingly higher, and there are a number of ill-advised bits of self-reference. (During one trippy interlude, George looks at Linda and says, “I loved working with you on the final season of Friends.”) Still, that Wain can assemble an alternate version of Wanderlust at all is an indication that he and Marino probably didn’t go into this film with the strongest, clearest vision. Judging by the evidence on the Blu-ray, a lot of Wanderlust seems to have been conceived on the set and in the editing room. These are the pros and cons of improv-inspired comedy. The upside is that it allows fast-thinking actors like Theroux to bring real spontaneity to lines like, “I drink the nourishment that God is feeding me though her cloud-teats,” (which he says when Seth is asked what he does in his outdoor bed when it rains). The downside is that there exists a version of Wanderlust in which Seth has such a complicated backstory—much of it seemingly the product of Theroux’s riffing—that he’s almost an entirely different character. Movies change in the editing all the time, but this seems to be less a post-production change of direction and more a lack of direction beyond whatever made people on the set laugh at the time. Don’t misunderstand: The wave of comedians who’ve dominated the genre over the past decade do fine work. Their movies are mostly entertaining, sometimes bordering on brilliant. But too many of these films lack narrative integrity, or rich characters, or a cogently expressed theme. Like the characters in Wanderlust, they make their own self-serving rules, while feigning anarchy.